We had a busy day yesterday at SheppyBrew Brewery and Smokehouse. We didn't brew any beer, but we started the day early by kegging Melting Stream Spring Saison. We bottled a batch of green tea kombucha and stared a new batch. And .. we prepared and made barbecue drumsticks. I bought a package of drumsticks at Sam's Club in the morning. I decided to make the whole package even though I knew it would be too much for our family of four. I like having leftovers for lunch. 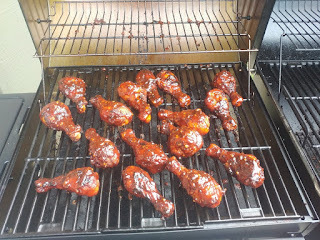 Yummy barbecue drumsticks for lunch will be great this week. 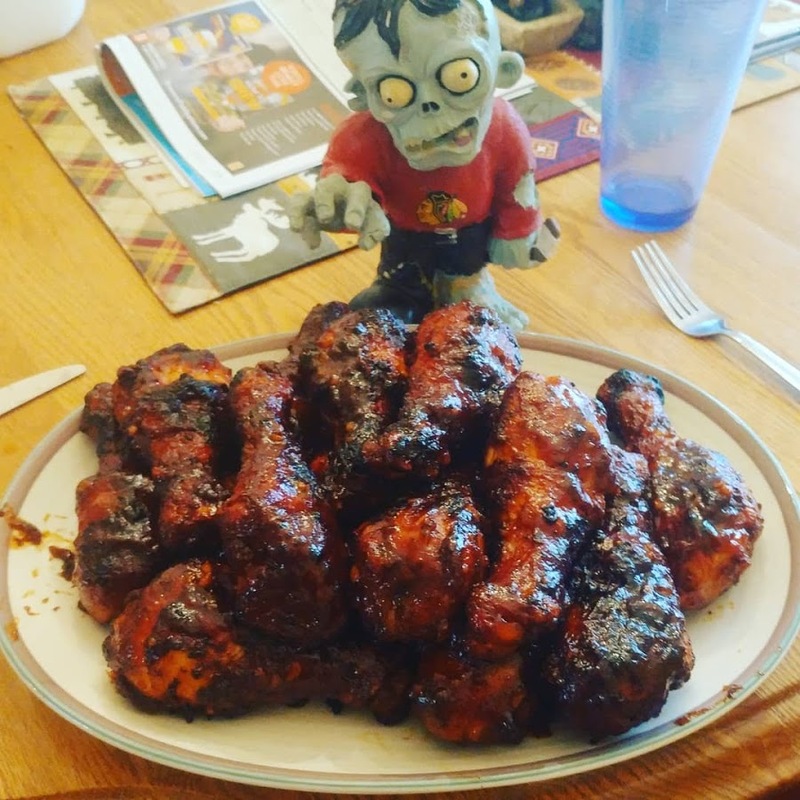 As soon as I got the drumsticks home, I made a rub to put on them. Just for the record, this made more than I needed. I saved the extra for some future grilling session. 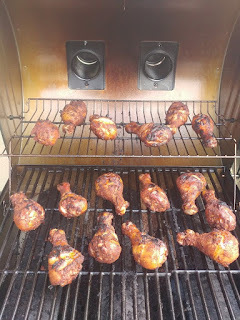 I let the rub sit on the drumsticks for several hours until time to put on the smoker. 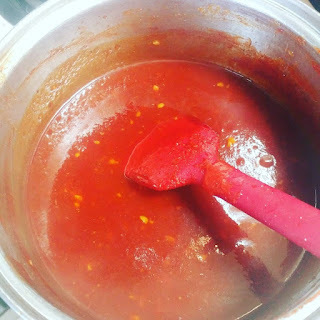 I also made some homemade barbecue sauce. I had intended to give myself enough time to smoke the rubbed drumsticks for about 2.5 hours at 225. 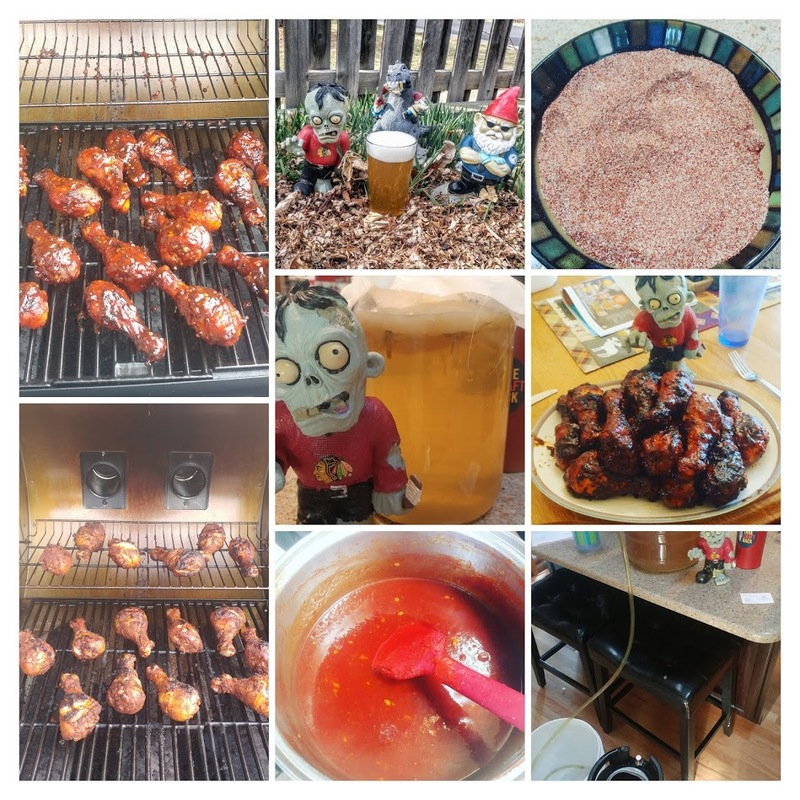 I got started late, and ended up smoking them for less time at a hotter temperature. They still turned out great. 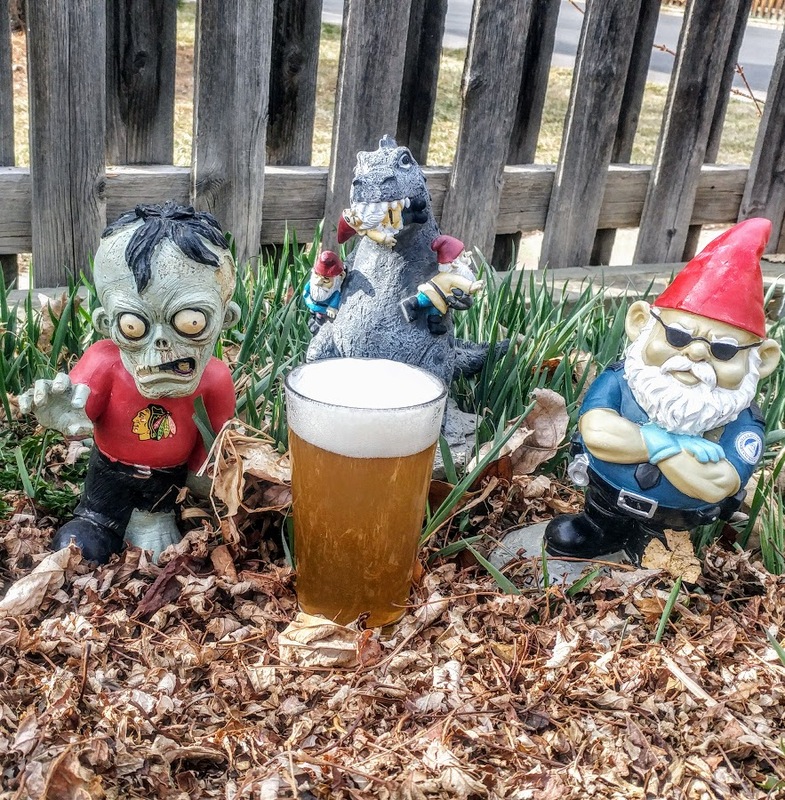 I had some of my Pats Disliker New England Pale Ale while going through the process. 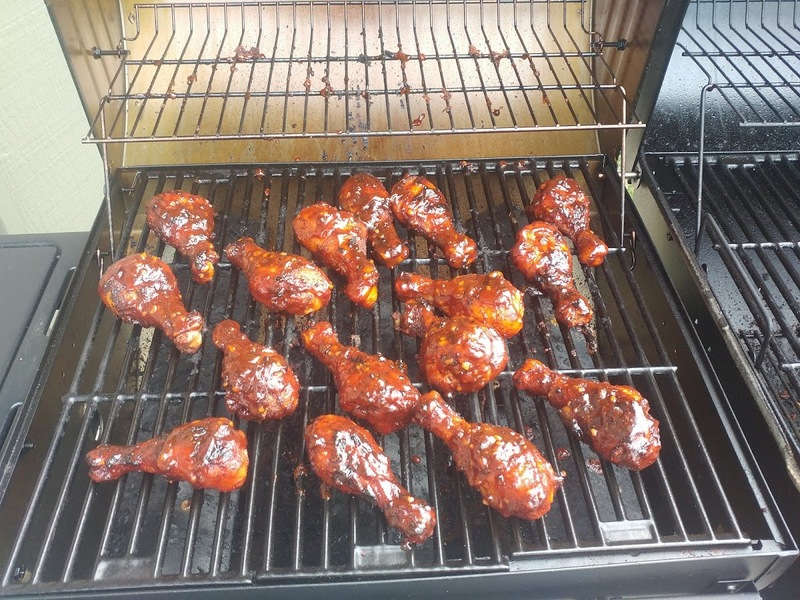 The drumsticks turned out great. I loved them, and if I'm honest, I should say that I had more than I should have. Still, I ended up with some left-overs for a lunch or two this week. Messy eating, but totally worth it. Used lots of napkins. If you try out the homemade barbecue sauce, let me know how you like it. Play around with it. I always do. 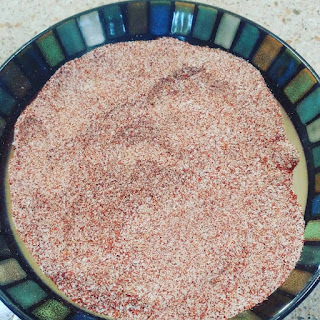 Sometimes it is spicier. Sometimes it is sweeter, but I always prefer it to store-bought sauce. If you want to see / read more of what I've grilled, be sure to check out See SheppyBrew: Grilling. Or SheppyBrew: BBQ. Or SheppyBrew: Smoked. Also keep an eye on the regular SheppyBrew Channels to see what is happening with this beer (and many others): SheppyBrew's Facebook Page; Sheppy's Twitter Feed;SheppyBrew's Instagram Page; and SheppyBrew's Website. And ... of course ... don't forget the new SheppyBrew Smokehouse and Brewery youtube channel. I'm going to make this sauce next week. Thanks. Good. I hope you let me know how you like it.